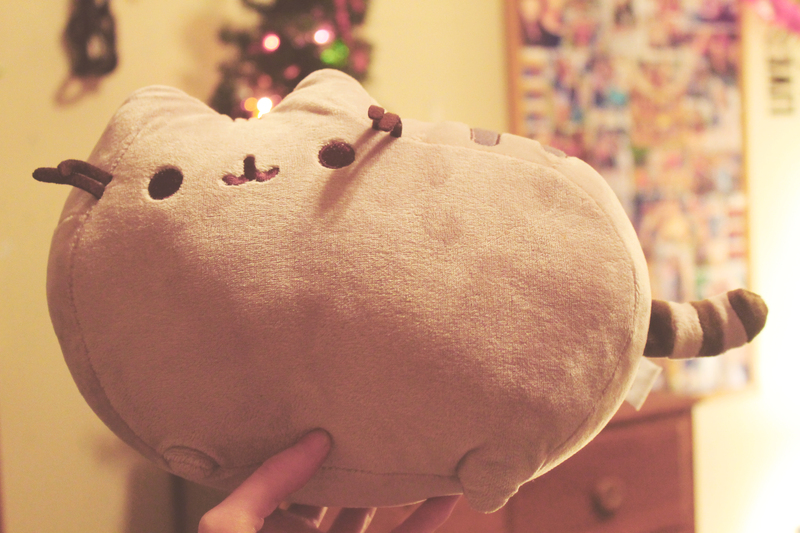 For an early birthday gift, I got what every girl wants: a Pusheen plush! Yes, my girlfriend surprised me with this little cutie when we started spring break, about a week and a half before my birthday happens. And what a great surprise he was. I’ve been aware of the new Pusheen plushes by GUND, but I love her even more than the pictures could have prepared me for. If you haven’t heard of Pusheen yet, you’re honestly missing out. Pusheen is an Internet meme that is, frankly, 1000% more adorable than the other memes like #TheDress and Surprised Patrick Star. I’ve been a fan of Pusheen since the first list of “6 Reasons You Should Consider Being a Cat” circled around the Internet circa 2010. According to KnowYourMeme.com (hey – that’s a reliable source when it comes to memes! Don’t give me the side eye, academia! 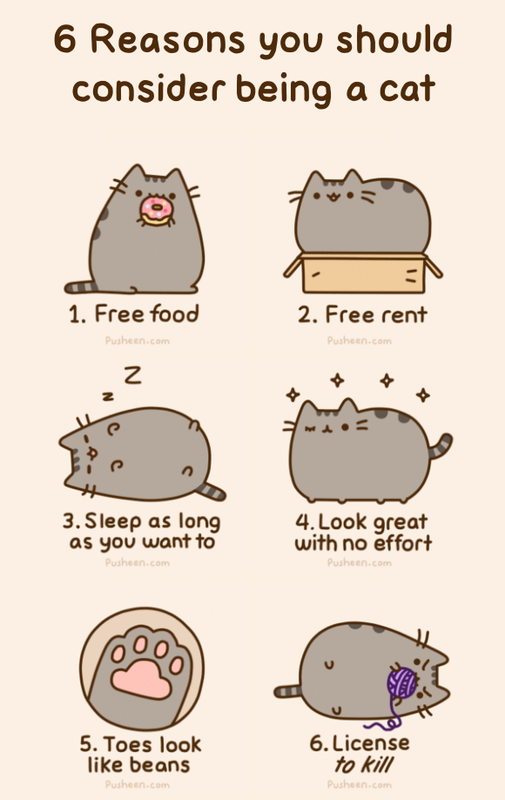 ), Pusheen originated in 2010 on Tumblr, via the comic “Everyday Cute” by artists Clare Belton and Andrew Duff. The artists say that Pusheen is based on Clare’s childhood cat, who was named puisin (the Irish word for kitten) after being adopted from a shelter. This origin story has everything I like: animal adoption, cats, web comics and artists. That was the first Pusheen comic I ever saw. I fell in love. I mean, come on. She’s fat, she’s cuddly, and she’s absolutely right – why wouldn’t you wanna be a cat? I never looked back from the adoration after that day. She bought me the Pusheen medium plush, which is 12″ in length and 7″ tall. You can purchase it on Hey Chickadee, but you can also buy it on Amazon. I’m not sure which website my girlfriend ordered from, what price she paid or how fast her shipping was, but I do know that she gave it to me before my birthday, so the shipping couldn’t have been that slow. 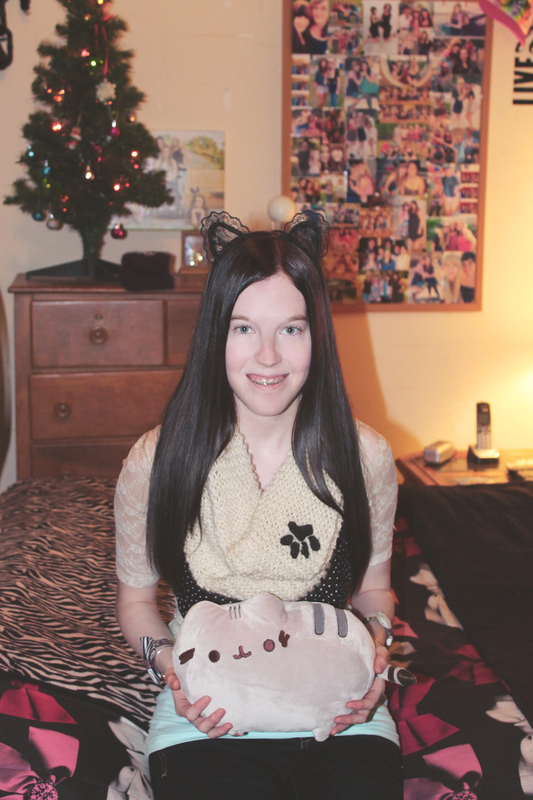 Overall, for the normal price range of the plush, I think it’s a great product to own for any Pusheen-lover. I would rate it a 10/10, and encourage GUND to come out with an even bigger sized plush for the Pusheen-fiends who want something more like a body pillow sized cuddle friend. Now for the cute story of receiving Pusheen: My girlfriend helped me move my things into my house after spring break. Before dropping her off, I asked her to close my eyes while I retrieved a surprise for her – it was a Pusheen plush holding an ice cream cone. I handed her it and she opened her eyes and gave me a huge hug. Then I went and dropped her off at her house. Afterward, when I came home, I went into my room and found my very own Pusheen, left with a note from her, letting me know he was an early gift. We literally both surprised each other with Pusheens on the same day. If that’s not a reason to instantly love her, I’m not sure what is! Isn’t he the best? I’m so glad you bought one!